A pergola is a decorative overhead structure made up of pillars and supporting crossbeams for an airy, open-roof shelter. Pergolas add classic style and architectural character to your home and are used to make the outdoors more inviting, to extend livable space, to create a shady retreat, and to serve as a major landscaping element. Pergolas can be used to mark transitions from one part of your yard to the next or to help define an outdoor living space for cooking, dining or relaxing with family and friends. Whether your outdoor living space is a suburban oasis or a sprawling country style veranda, adding an outdoor structure will add value to your property. By installing a pergola you are effectively increasing the floor space of your home. 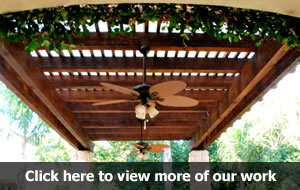 Patio Creations can help you create a pergola that reflects your own personality and style. You may find yourself cooking outside and entertaining more often under your new pergola and your new pergola may just become your family’s favorite part of the house. In addition to pergolas, Creative Patios also designs and builds screened porches, patio covers, decks, and many other types of outdoor living spaces. Contact us to learn more or to schedule a free in-home estimate and no obligation design consultation.